Pulling out the cord and reaching down to plug it in and out makes vaccum cleaning a time and strength-consuming task and a burden on everyday life. Sharp wanted to make cleaning simpler and more fun - and developed a cleaner aiming to change cleaning into a task that can be done anytime, anywhere and by anybody. There are times when you need to vacuum right away, and cannot wait for hours for your cordless cleaner to recharge. We decided to develop a rapid charging battery for our cordless cleaner. However, a quick charge requires a large circuit, which would make the base unit larger. So how could we realize a quick charge and have a small and light weight base? The challenge was to think outside the box, looking for a completely new idea. As a result, we developed the "Separate Charge" system, where the battery is charged by a separate unit. The battery is detached and set into the charge unit, realizing a quick charge and also ensuring small and light weight main unit. This also solves the issue of carrying the cleaner to a nearby socket when charging the battery. It is quite a task to clean dust in stairway corners or candies dropped in the car. Large, heavy cleaners are a burden to carry, and the temptation to simply brush away the dust and "overlook" the rest is overwhelming. What is needed is a small and light weight cordless cleaner that makes cleaning as easy as the brush of a hand. So how did we develop such a small and light weight product? We focused on the motor. Sharp's cordless cyclone cleaner introduced last year consists of a motor with a separate circuit connected by cords. If these can be put together, would it not lead to making the product smaller? The challenge here was to redevelop the fan shape, noise reduction structure, and fabrics in order to maintain high suction performance while also achieving a small size and light weight as well. If cleaning can be done more freely - anywhere, it may change the whole outlook on cleaning. Which part of the cleaner do people hold when cleaning? Even if the product is made smaller and lighter, the weight you feel and the burden on your arms will be changed by the way you hold it. Many tests were made, and we learned that people hold the cleaner in different positions depending on the person's height. In order to make the product easy to hold, the handle is shaped in a circular form. This allows changing the holding position freely, so you can hold the handle however it best suits you, whether you are cleaning the cupboard or under the table. This is another step that makes cleaning easier - for anybody. 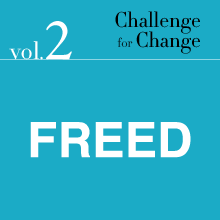 The product brand name "FREED" expresses the concept of bringing more FREEDOM to cleaning by disengaging factors of time, place and person. Whenever you find some dust, you can clean it up on the spot. This freedom is what we sought to realize with this product. Your room becomes clean with greater ease. This makes cleaning a much more pleasant chore. Cleaning is often referred to as one of the most burdens of household chores. As a home appliance maker, our mission is to support people in living comfortably with less of a cleaning burden. The challenge Sharp has met was to create a new style of cleaning with our three types of cordless vacuum cleaners. "FREED" is for quick and frequent cleaning. 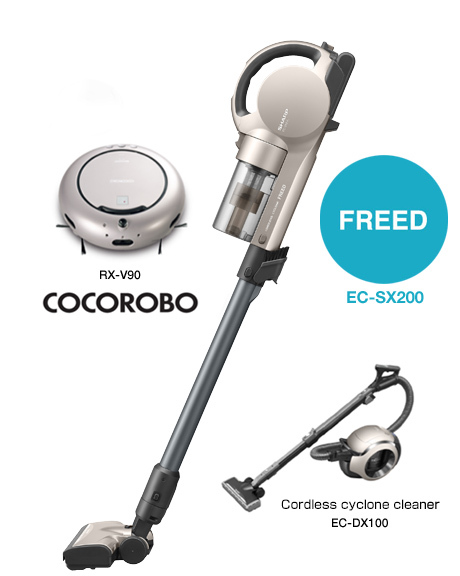 "COCOROBO" is a robotic cleaner that cleans the floor automatically, for those who spend long hours away from home. The cordless cyclone cleaner with caster wheels is recommended for cleaning rooms thoroughly. By reducing the burden, we would like to change cleaning into a more enjoyable household task. Sharp is a company with a Business Creed that states, "Creativity promotes progress... remain constantly aware of the need to innovate and improve." Yes, Sharp will continue meeting its challenges. *The products introduced above are available only for the Japanese market and some limited other areas (as of June 2014).